At the time of writing, the UK Education Secretary Michael Gove – horror fans may think he looks a little like Erich von Stroheim’s dummy in The Great Gabbo – is dismantling the National Curriculum for students and rebuilding it in a classical liberal image. Teachers that I meet in my day job are worried about what they ‘should’ be teaching, and the spectre of Ofsted – who don’t need to knock anymore to cross your threshold – looms over fearful schools. In this climate, therefore, I think we need to harness the confusion and use it to bring about change. We’re like an audience at a Derren Brown show, waiting for the next miracle of mystification and wondering what could happen next. 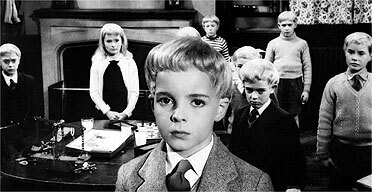 We’re like the townsfolk in Village of the Damned (‘Beware the Stare’!) , uncertain and bewildered by the political creature we made. We’re like Robert Olmstead in The Shadow Over Innsmouth, sleepless in the Gilman House Hotel, hearing scratching noises at our door. But this is an opportunity to shape the minds of the future. We’re in an age of ambiguity – and children can learn from this. Let them read ghost stories, and know that within the everyday and the ordinary, the extraordinary can occur. I realise that this is contentious. Some children are just not into ghost stories. Some children have nightmares about things we adults may consider mundane, like queuing and supermarkets. Are they ready for stories that may tingle their spine and chill their blood? When I taught a class of Year 5 and 6 in Taunton, my favourite part of the day was story time on the carpet just before home time. Some protested that they were too old to sit on the carpet; only Key Stage One did that. I solved this through the ancient art of bribery – buying beanbags from Ikea (the official store of primary school teachers) and giving house points for the best listeners. This ensured that they would sit still without too much fidgeting, and be able to concentrate on the story. I would only ever read ghost stories, or tales with a thrilling or spooky element – we started ‘The Secret Garden’ once but ended up voting on whether to continue. Overwhelmingly, the vote was to bin it and start a new Anthony Horowitz. We read the classics – Neil Gaiman’s Coraline, Alan Garner’s The Weirdstone of Brisingamen, Horowitz’s Raven’s Gate (a book with an interesting history, and more than a hint of Hammer about it), anything by Joan Aiken – especially her short stories – and The Ghosts by Antonia Barber, which is now sadly hard to find. Occasionally we’d read something I’d found in Waterstones – a cracking novel called The Stolen by Alex Shearer, about body-snatching witch grannies, went down very well – or by request, an old favourite like Cirque du Freak. What I particularly enjoy about modern children’s authors is how they reshape tales of the past for modern children. Anthony Horowitz rewrote W.W. Jacobs’ The Monkey’s Paw in Horowitz Horror, and Chris Priestly adapted M. R. James’s work for Uncle Montague’s Tales of Terror. On a less literal level, Marcus Sedgewick’s My Swordhand is Singing is a new iteration of the Dracula legend, complete with Eastern European peasants and dark mutterings of the dangers of the night. Even Horowitz’s Power of Five sequence (Raven’s Gate being number one in the series) owes a lot to the Cthulhu Mythos. It’s in these timeless stories that we find the lessons of today – that the world is a big place after all, with unknown corners and unseen things. At this time, all children should be reading stories like this. They should be ready for whatever might suddenly leap out at them from the shadows, and know that the ‘fun of the shudder’, as Edith Wharton called it, will prepare them for whatever unexpected events may occur. And who knows – if they read M.R. James, they may learn a little Latin along the way – and wouldn’t that please Mr Gove?